I’m a lucky guy. Because of my work in helping to shape and support corporate volunteer programs, every day I get to see inspiring stories that underscore the power of volunteering to make a difference. It’s so clear to me that when people engage in improving their communities and helping others, the world shifts a bit – not just for the community, but for the volunteer as well. And when that volunteer effort is part of a corporate program, the company reaps added dividends, in the form of more engaged and loyal employees. National Volunteer Week, which falls April 12th through the 18th, is dedicated to inspiring, recognizing and encouraging people to seek out imaginative ways to engage in their communities. With a theme this year of “Celebrating Service,” the occasion is all about showing the good that is possible when we pull together as a nation. A program of Points of Light, National Volunteer week has grown enormously since its inception in 1974, with thousands of volunteer projects and special events scheduled throughout the week. As an example of how some companies are championing volunteering this week, UnitedHealth Group, one of the main partners that produces America’s Health Rankings every year, is sharing the findings of last year’s rankings with their employees, with the goal of encouraging people to volunteer for health-related causes. UnitedHealth Group has done great work supporting its employees to give back to communities through microvolunteering, virtual volunteering, and the company has supported research linking volunteering to better health. Its strong commitment to volunteering is one reason that Points of Light honored UnitedHealth Group as part of its Civic 50, an initiative to identify the 50 most community-minded companies in the nation. Points of Light will be shining its light on other good corporate citizens this week as well, including CSAA Insurance Group, which has partnered with Yosemite National Park to help clean up and keep our national parks safe. Points of Light will be releasing its case study about this initiative during National Volunteer Week. Points of Light also recently published a case study about Carolinas HealthCare System’s International Medical Outreach Program, which sends medical technicians abroad to help strengthen health systems in developing countries. Points of Light’s case study focuses on a cardiovascular specialist with Carolinas HealthCare who recently volunteered in Belize to train healthcare workers in cardiac care. But don’t be daunted by these pioneering acts of service and think that humble old you or your ordinary company doesn’t have something valuable to offer this week and every week. Find a way to reach out and step up to the causes you care about, and then share your experience within your company, network and community. 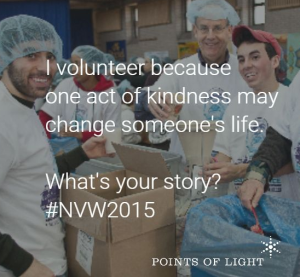 The goal is to get #NVW2015 to trend during National Volunteer Week. Tag friends and get them to share their stories, too. This National Volunteer Week, remember that the more you celebrate service, the greater you enrich your life. When you give back, you get back more.